If you’ve ever picked up a cream to soothe your dry hands, it may have contained ‘buerre de karité’ or shea butter, harvested from the Shea tree by women in rural Burkina Faso. Burkina Faso is a land-locked country in West Africa, where household water security poses a significant challenge for rural communities which count for around 70% of the population. Many areas experience unreliable and variable water conditions, including water scarcity and periods of floods and droughts. When it comes to household water supplies, women play a central role in collecting water for not just domestic activities but also for small enterprises like shea butter production. In a study located in the Nouaho sub-basin in the Centre-East region (not far from the border with Ghana and Togo), researchers from the Stockholm Environment Institute and the International Institute for Water and Environmental Engineering (2iE) in Burkina Faso are investigating gender-based vulnerability to water security challenges, with the help of local water and sanitation authorities and NGOs working on these issues, including WaterAid and women’s associations. In the study region, many villages get their water from boreholes and have very little access to sanitation. Due to existing gender roles, women, with the assistance of children, are responsible for collecting water for drinking and washing, as well as for their household activities such as cooking and laundry. 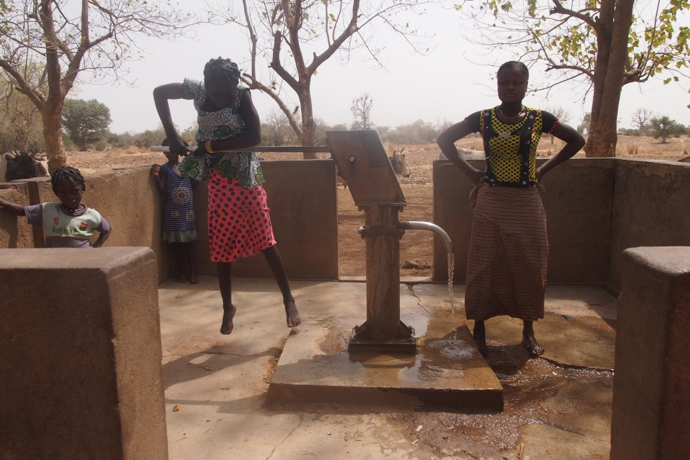 Despite having access to an improved water source, they often face shortages in the dry season. This lack of water can result in wait times of several hours and women prioritise water for critical uses such as drinking and cooking during these periods. These groundwater resources must also be shared with livestock during dry periods when there is limited surface water available. This affects the men as one of their water-related roles is to make sure there is enough water for cattle. Limited water supplies mean that productive activities carried out by both men and women slow down or come to a halt. In the study region, women from the Mossi ethnic group generate income from making sauces, snacks and juices to sell, producing shea butter, and vegetable growing. But it’s often difficult or even impossible to do these activities without enough water. Communities face particular challenges during extreme events, such as droughts and floods. For example, women who harvest Shea fruit told us that flood conditions damage trees and result in lower harvest. In addition, women have lower education levels and stay at home during these difficult periods while male household members may migrate for work. This may mean that women are less able to cope and adapt to increasingly variable climate conditions that impact water security. We’ll be investigating this theme further in the next steps of this study. Understanding women’s water, sanitation, and hygiene (WASH) vulnerability is one of 12 Catalyst Projects funded through REACH Partnership Funding.